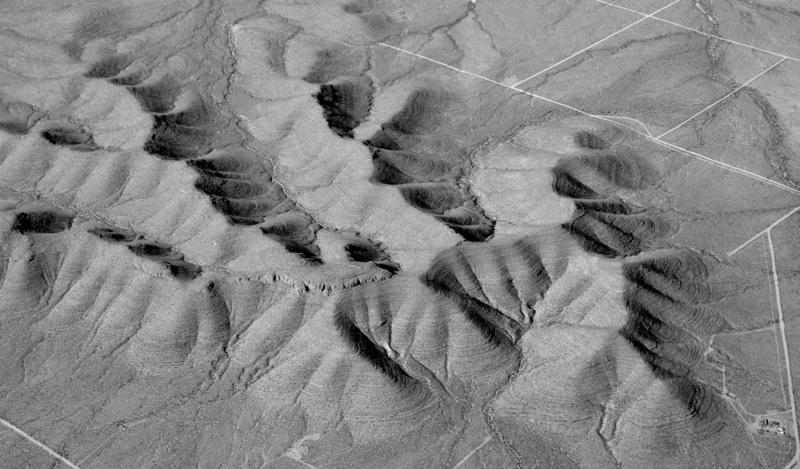 "The county comprises 1,057 square miles of desert and irrigated land that rises from an elevation of 3,500 feet at the Rio Grande to 7,000 feet at the summits of the Franklin Mountains. 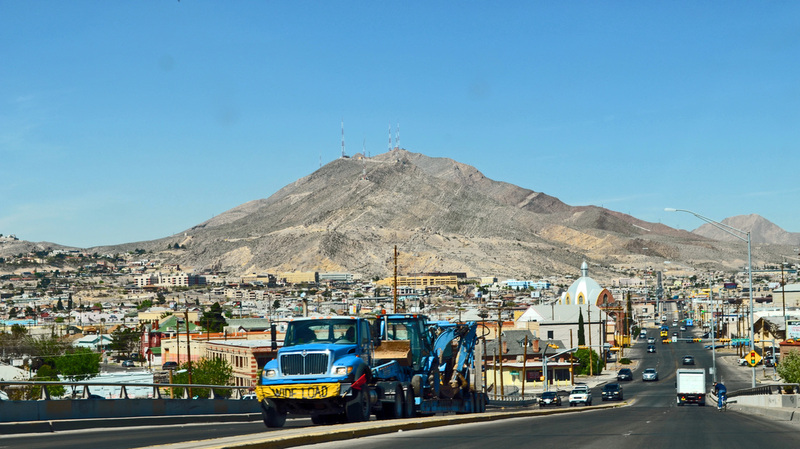 "The Spanish name El Paso del Norte denotes a historically important geographical point, the channel cut by the Rio Grande through the mountains to form a natural passageway for travelers to the north or south, east or west. 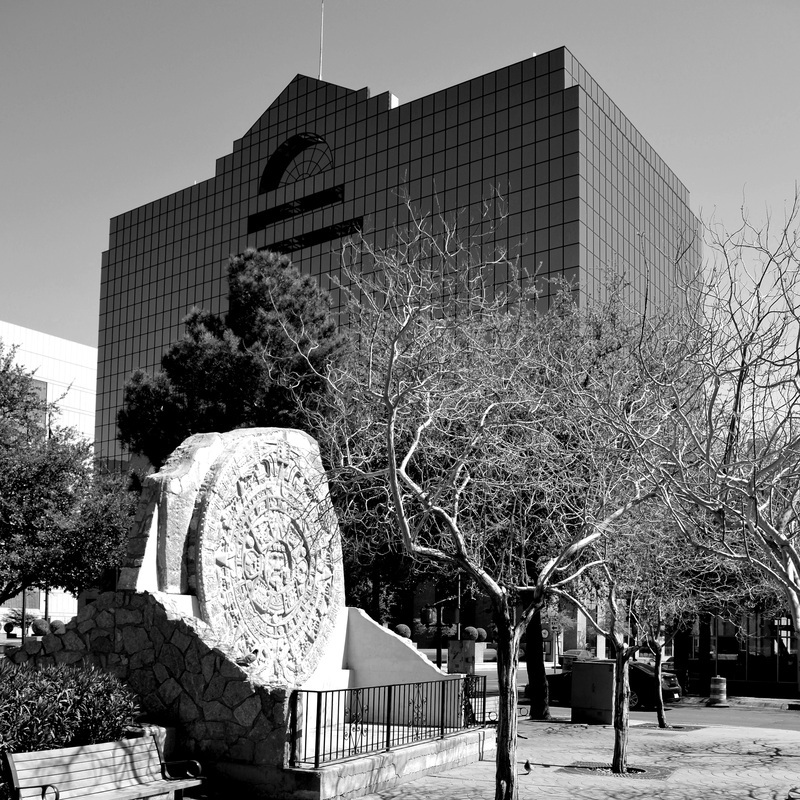 The name El Paso appears in print as early as 1610, in the narrative of Gaspar Pérez de Villagrá, poet-historian of the Oñate expedition of 1598. 1836–45, the period of the Republic of Texas. 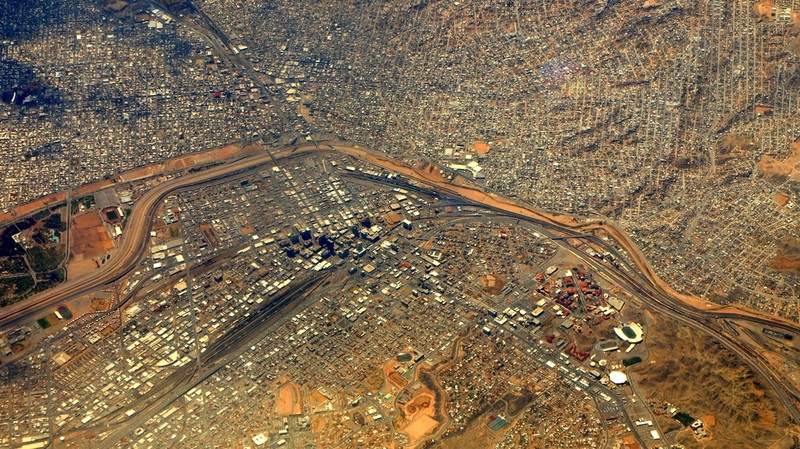 An old and valued part of the Republic of Mexico, the El Paso area went its own way. Then came the Mexican War, and the resulting Treaty of Guadalupe Hidalgo in 1848, which made all of the area north of the Rio Grande a part of the United States. 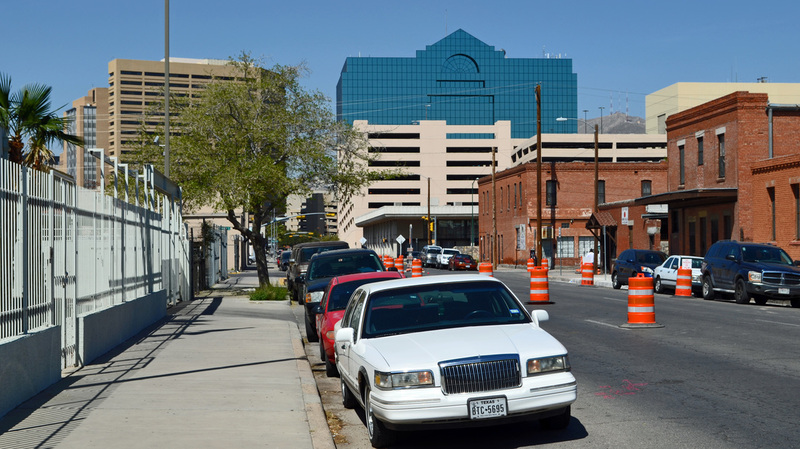 Suddenly the historic gateway at the pass became important to Texas, and the state almost immediately attempted to assert its right to the area. 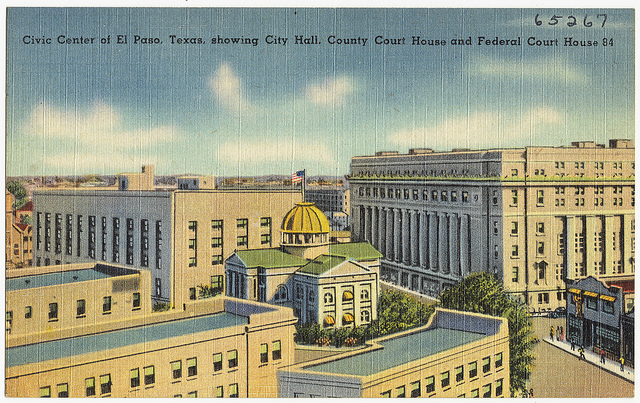 On March 15, 1848, the Texas legislature proclaimed Santa Fe County, which included the area of present-day El Paso County as well as other parts of west Texas and much of the present-day state of New Mexico. 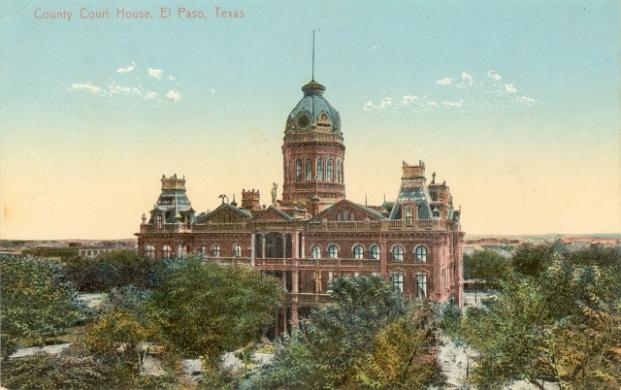 "In January 1850 the Texas legislature subdivided Santa Fe County into four smaller counties, one of which was named El Paso County; San Elizario, the ancient Spanish presidio town, was chosen to be the county seat. 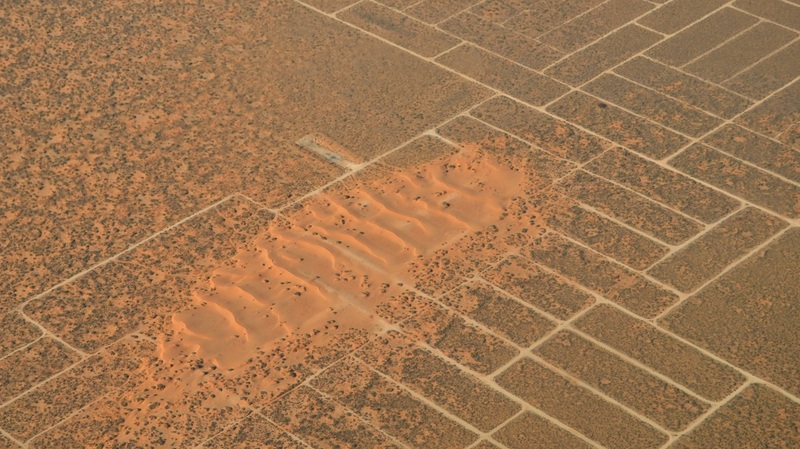 "Parts of the original county were subsequently stripped away from Texas as part of the Compromise of 1850, passed by the United States Congress in November of that year. 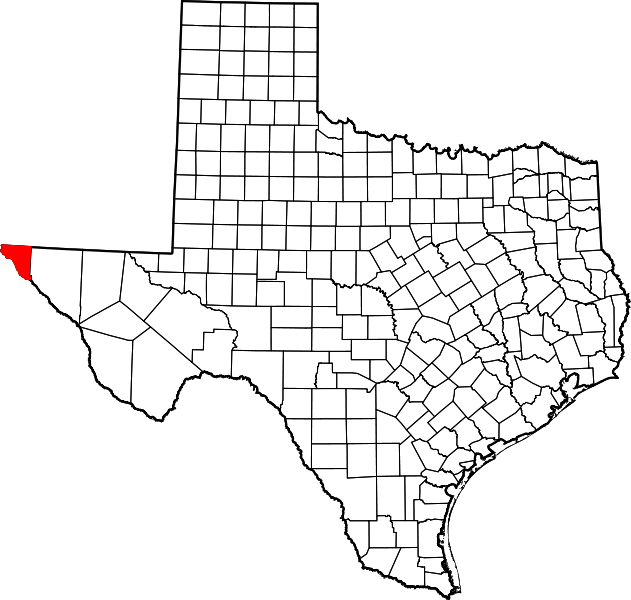 In its resulting form the county also included the present Hudspeth and Culberson counties; Culberson was separated in 1912 and Hudspeth in 1917. 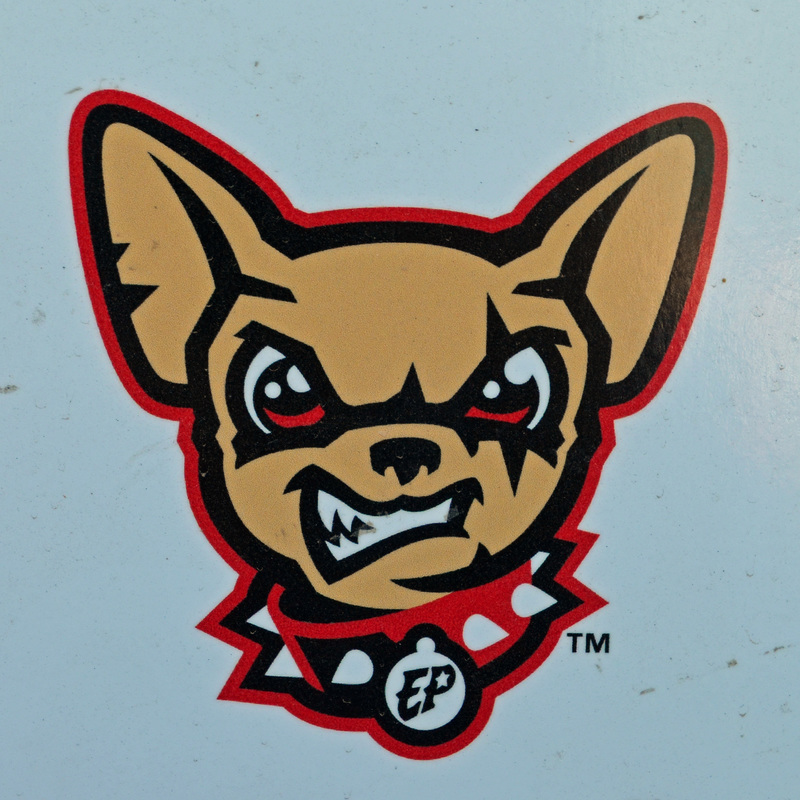 "In 1866 the county's government was moved from San Elizario to Ysleta, one of the oldest settlements in the county. 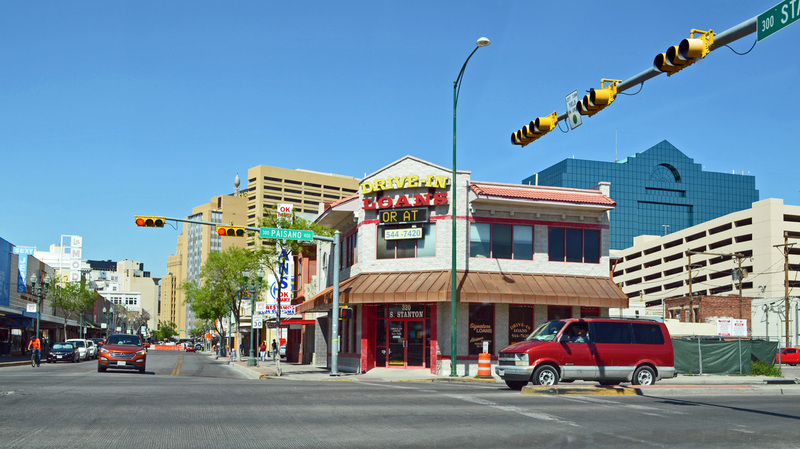 Then, in 1868, San Elizario again became county seat; it retained the role until 1873, when another election made Ysleta county seat. 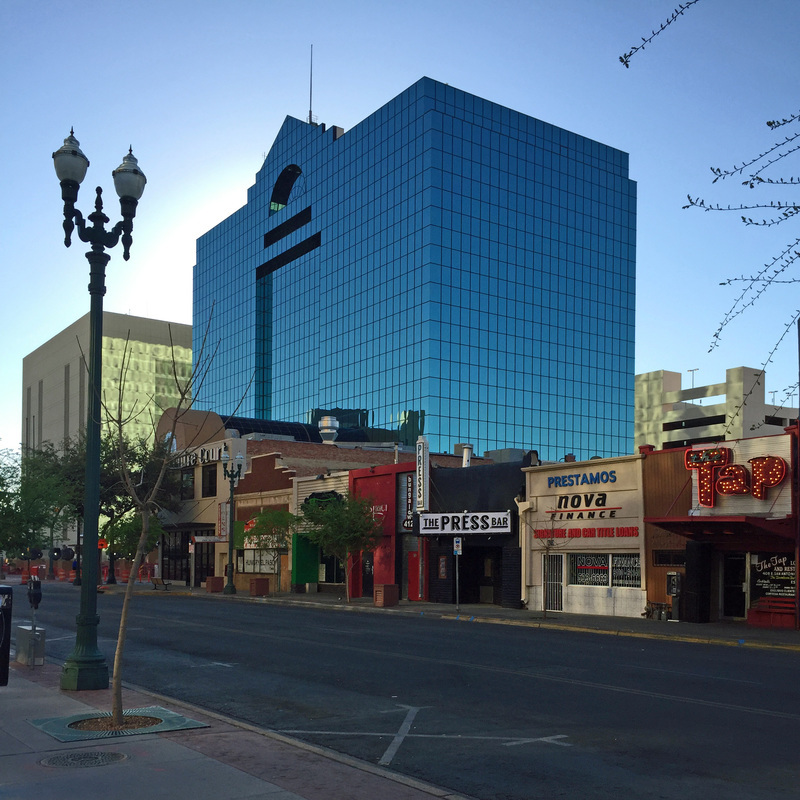 In 1883, after yet another hotly contested election, El Paso became the county seat. 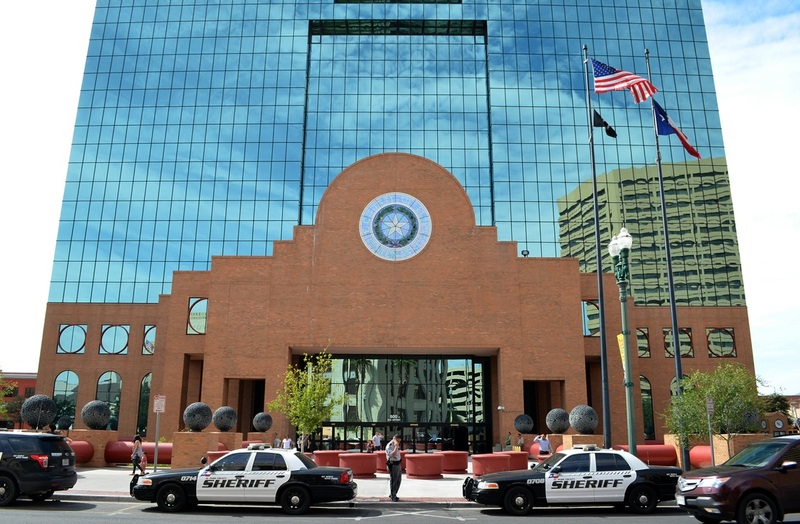 I visited El Paso County and photographed the courthouse in El Paso on March 22 & 24, 2013, August 14, 2014, and March 10 & 11, 2016. Alfred Giles, architect. J.W. Britton, builder. 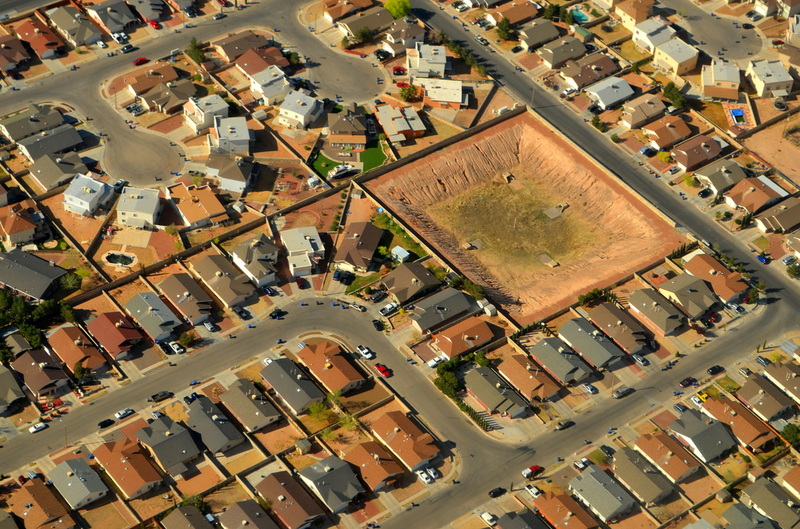 Compare to Presidio County. 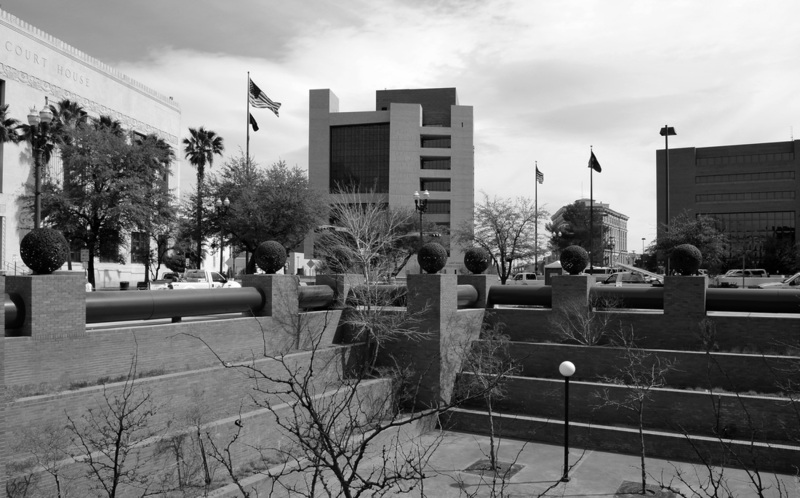 The El Paso County courthouse was designed by the local architect Henry Charles Trost, of the firm Trost & Trost. The classical revival design was a reinforced concrete building with brick veneer, monumental columns and classical terra cotta details. "The wings of the  building surrounded the 1886 structure which was then razed to make room for the 2,900-seat auditorium [known as Liberty Hall]. 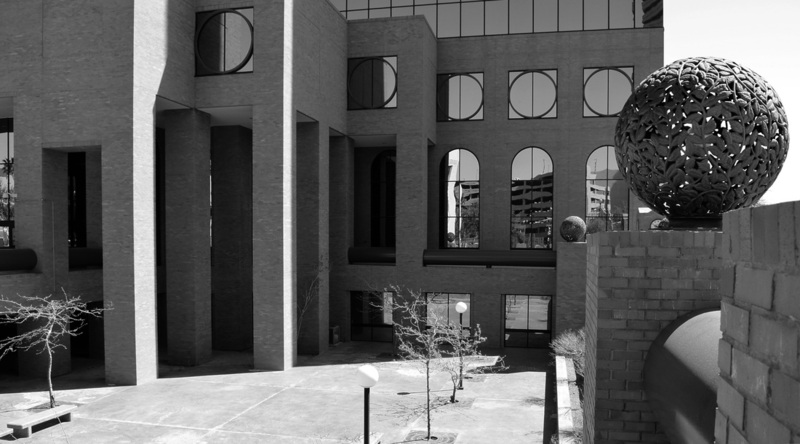 "Everyone would probably agree that the Trost courthouse was majestic, even though it bore no resemblance to the one it had replaced. Twelve mammoth columns across the front presented an elegant and grand appearance. 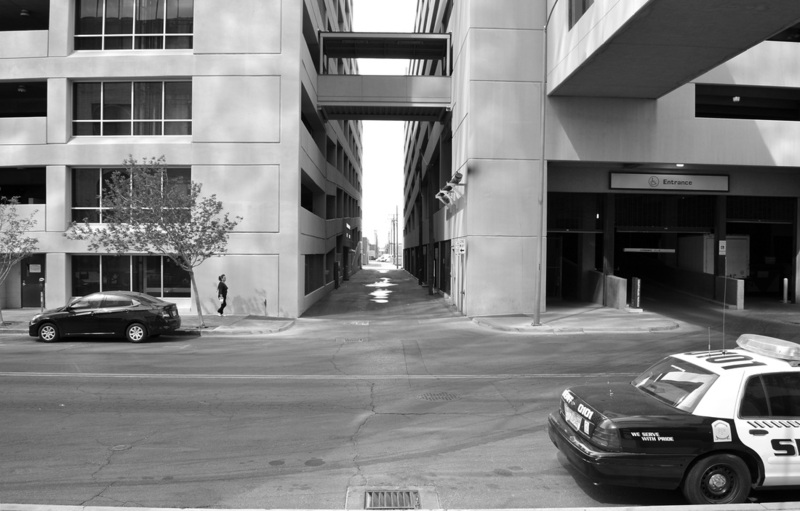 It was a more-than sufficient building for its time, but later its very design would eventually limit its usefulness. The auditorium, which was situated between the two horseshoe wings, split the building in half. 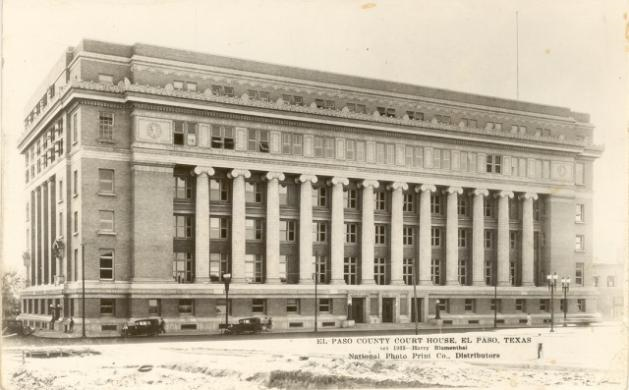 "...in 1955, when a major remodeling job was undertaken to add more space [to the 1917 courthouse], it also obliterated the imposing face of the building by completely removing the colonnade. 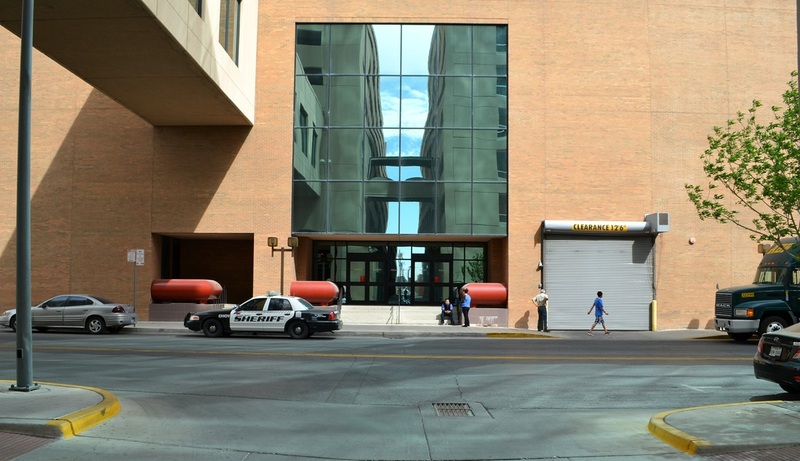 The result was the most bland and uninspiring front to ever grace a public building. 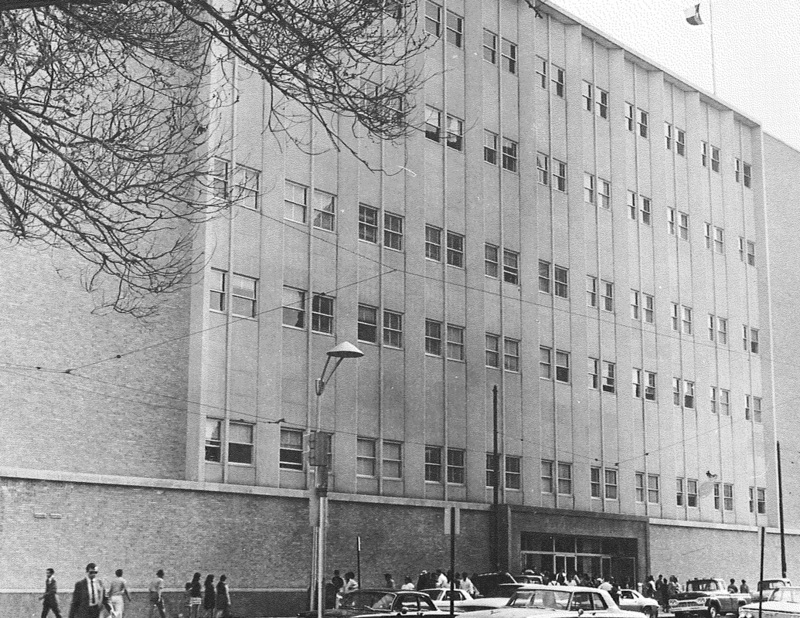 "As part of the remodeling program, another horseshoe shaped structure was wrapped around the outer walls of Liberty Hall to make way for more office space. 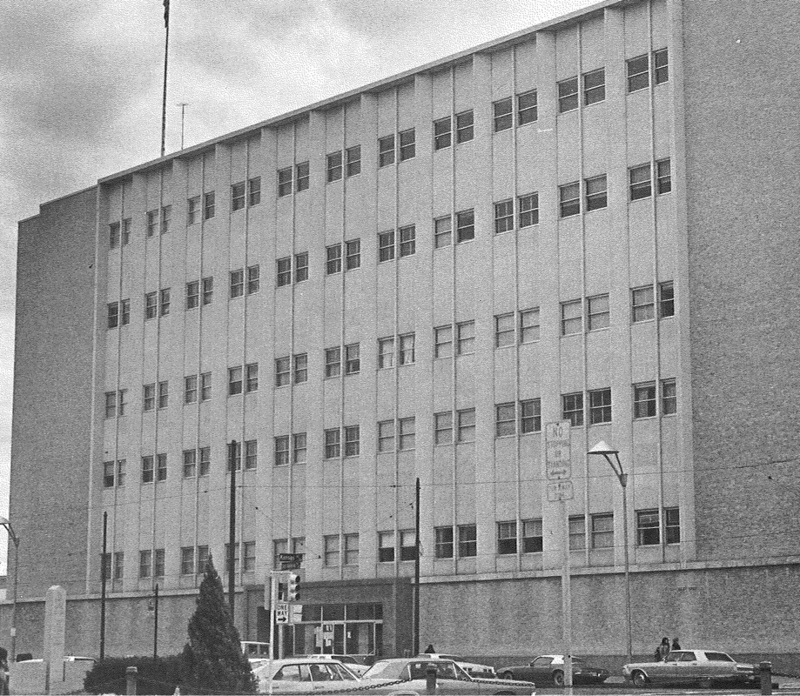 Several stories were added to the top of the original Trost building to house the sheriff's department and the county jail on one side, and the city police and city jail on the other. 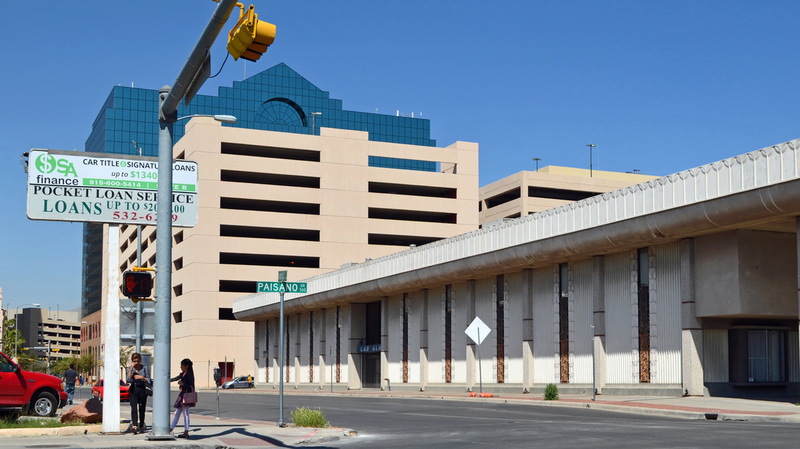 "The primary reason for remodeling was to bring El Paso city government into the building as a co-tenant. 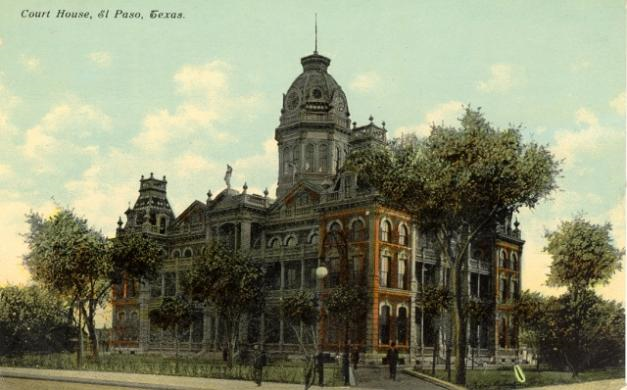 As part of the project, the 1888 City Hall, located near the intersection of Kansas and San Antonio Streets, was demolished (see postcard at right). 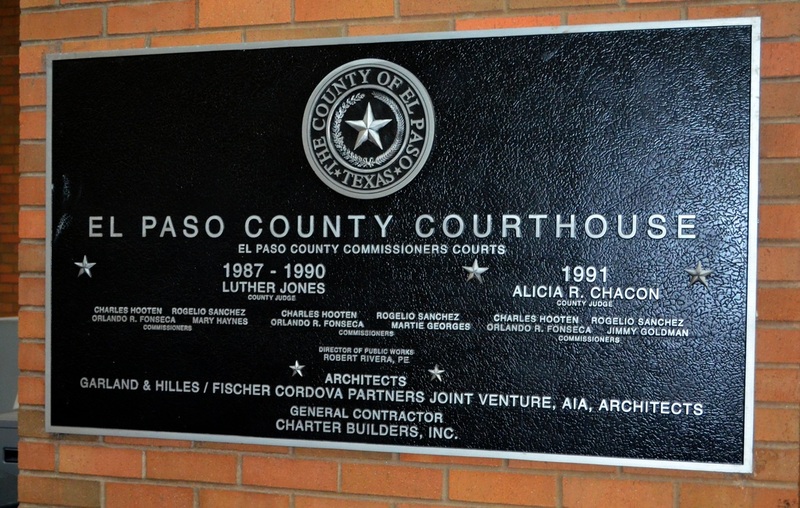 The city then moved into the remodeled building which became known as the El Paso City-County Building." 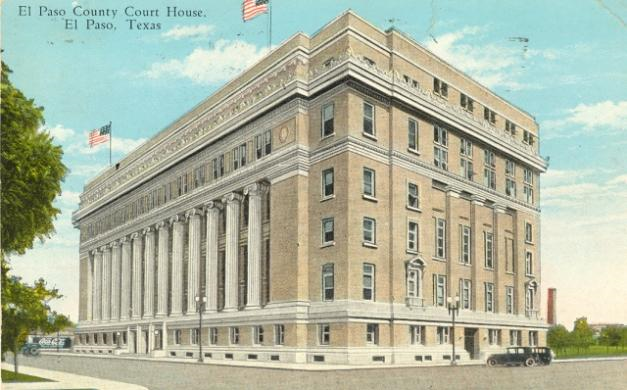 The transformation of the 1917 courthouse in the mid-1950's was absolute. 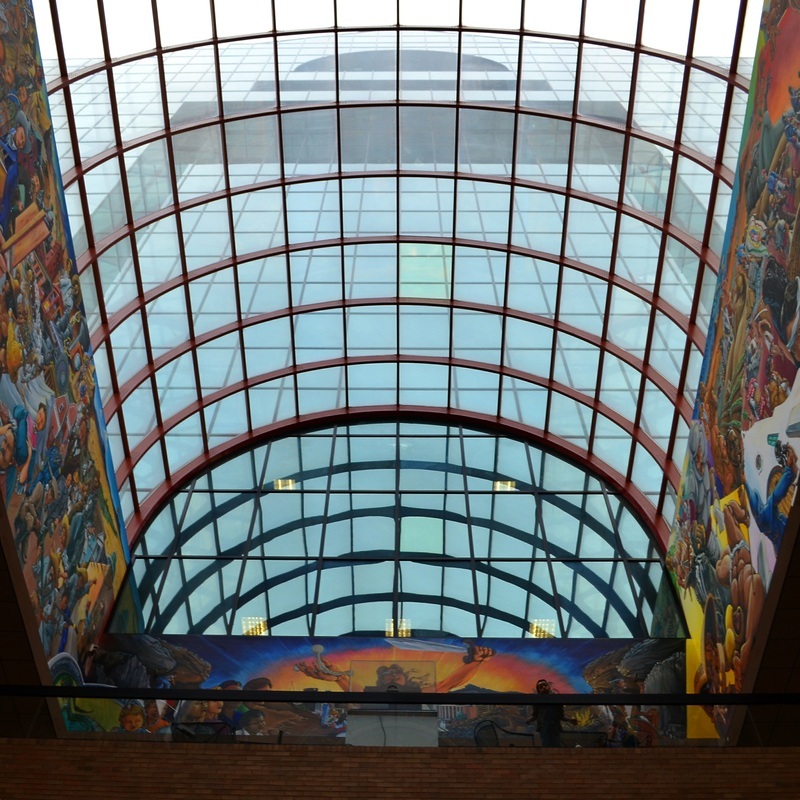 On the exterior, nothing was left of the classical styling and detailing of the historic building. In its place was a generic "modern" building. What a loss. 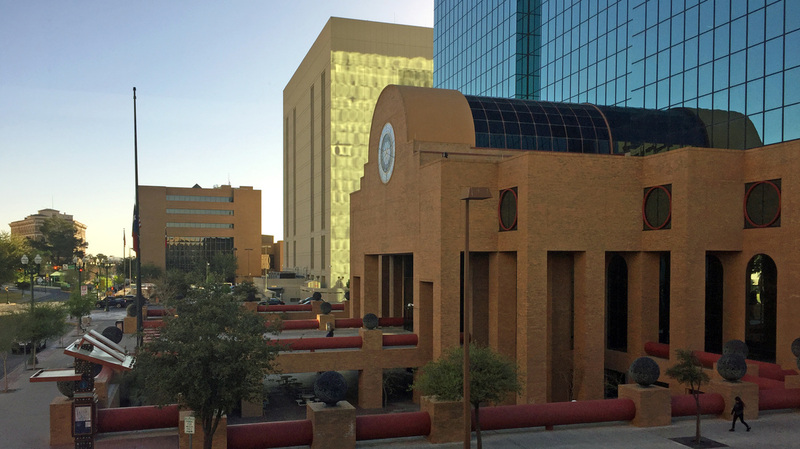 The current courthouse occupies the same city block as the historic 1917/1955 buildings. 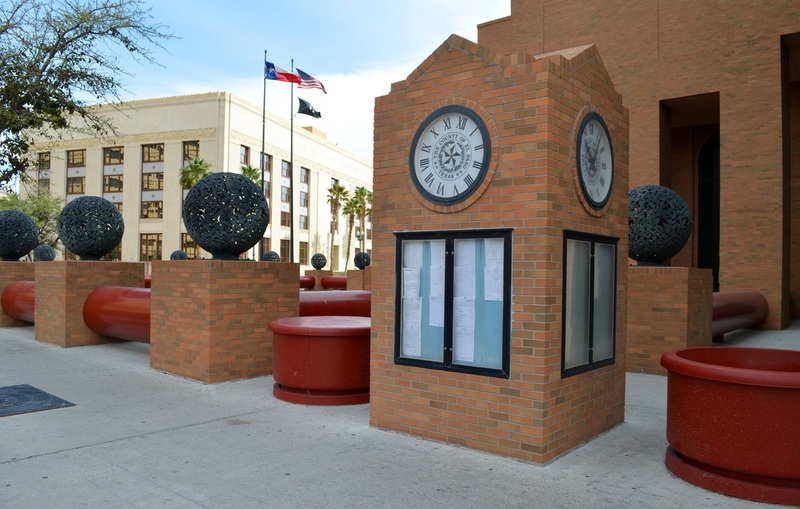 It began with a large, glass walled office building, erected directly behind the historic courthouse. 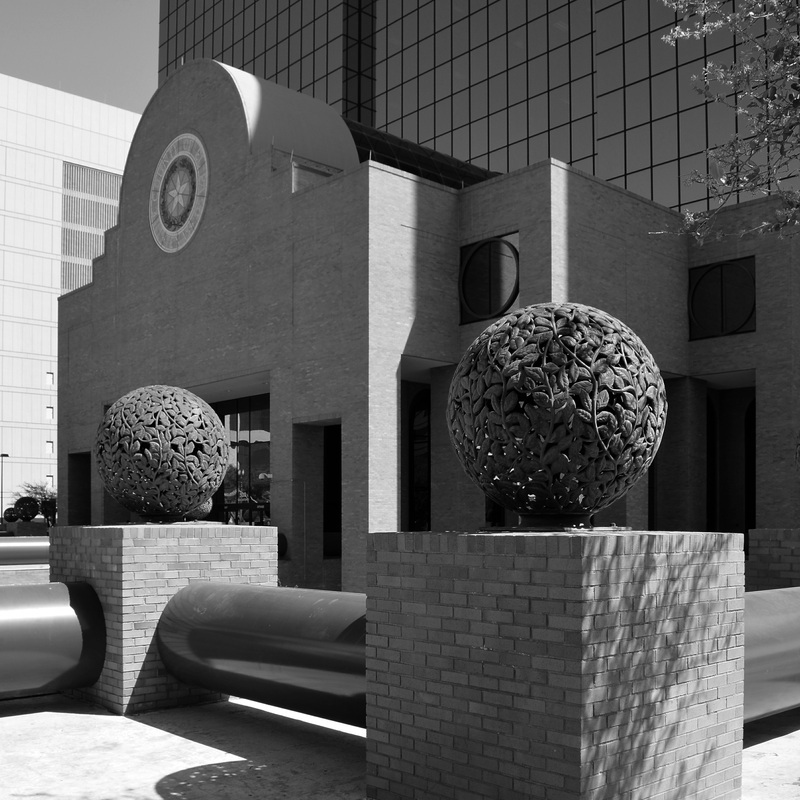 When the office building was complete and occupied by the county, the historic courthouse was demolished, making room for the new courthouse entrance, a barrel vaulted structure with a masonry skin, contrasting with the highly reflective skin of the office block rising behind and above the ceremonial entrance. 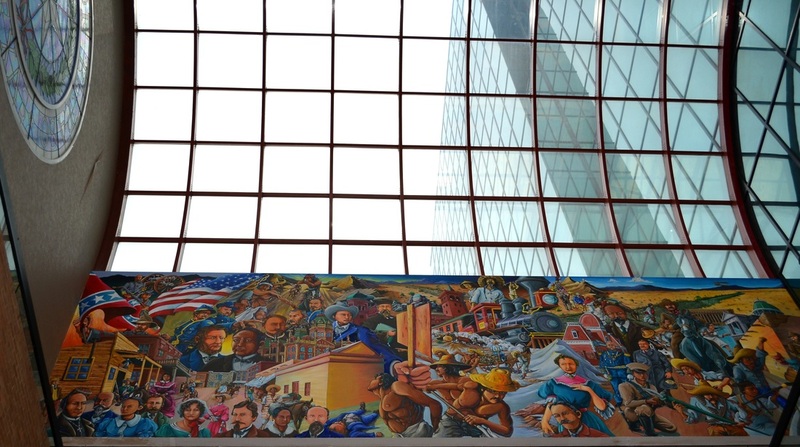 It is a post-modern styled composition, relying on evocative silhouettes. 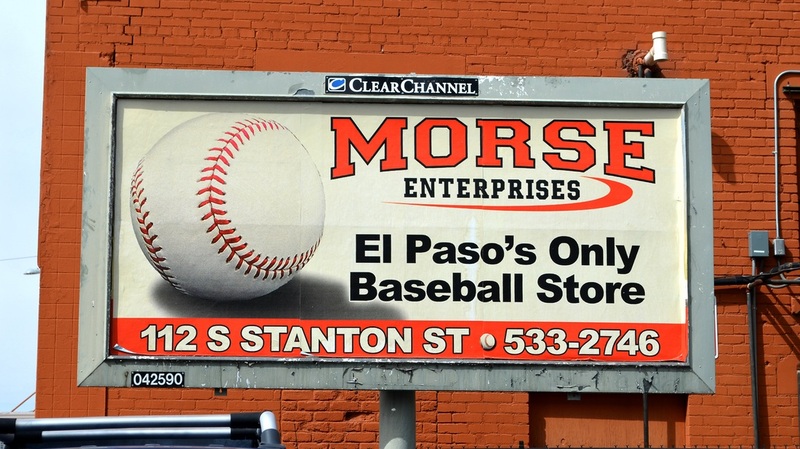 A billboard across Kansas Street form the courthouse: good to know in a baseball emergency. 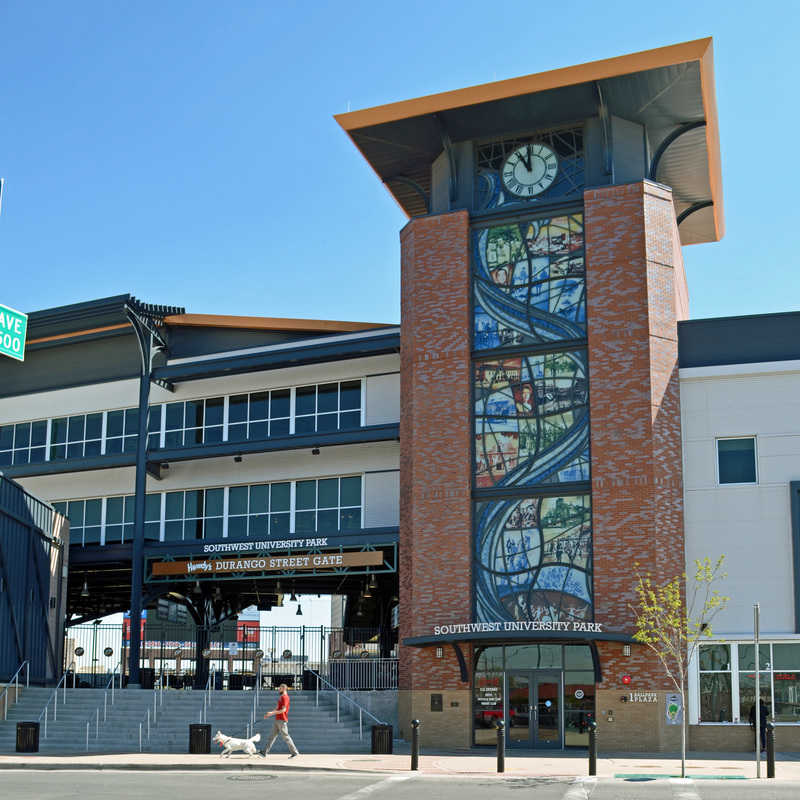 Speaking of baseball, the new minor league ballpark is delightful!